Kiln-drying timber is not a realistic option for small-scale turning workshops. There is, however, another process for artificially drying timber that is practical at any scale, and that is the use of dehumidifying dryers. Developed in the 1970s, this innovation has gradually evolved over time to the point where we now have a range of small-scale units suitable for any size of woodworking operation. The principle of kilns is fairly simple. 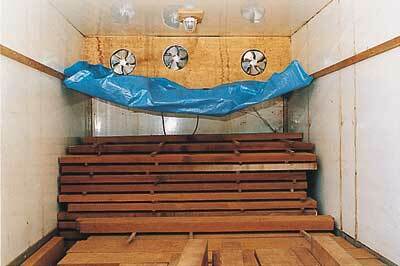 Warm dry air is drawn through the sealed 'drying chamber', and picks up the moisture evaporating from the wood. This then passes over refrigerated coils, which cool it to below the dew point, so the water condenses out and runs away to an external drain. The air is then passed over heated coils again for re-circulation, the forced draught being provided by fans, as in a conventional kiln. The beauty of this process is that to a large extent it is self-generating, effectively working like a fridge in reverse. The water condensing out releases latent heat which warms the atmosphere in the kiln, so the air can hold more moisture. Obviously, for this to work efficiently the drying chamber must be completely sealed - we don't want to extract water from stray air entering the kiln. The chamber must also be well insulated. It's important to retain as much of the heat as possible; the warmer the air, the quicker the drying will be, and the less extra heat input needed. 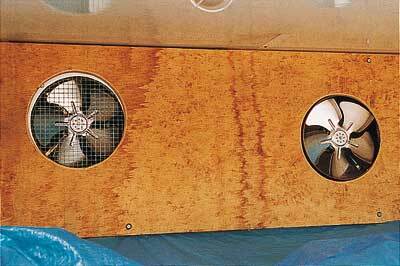 Drying by dehumidification has two main advantages. 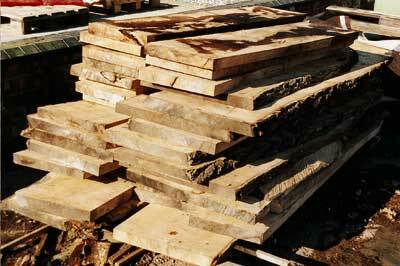 First, the quality of the wood produced is usually very good, with little or no degrade, mainly because the drying conditions are so mild. This also means that both different species and different sizes can be mixed in the same kiln load. Second, the capital costs of building a kiln are fairly low, and once built it is very cheap to run. The downside is that drying times are much longer than in a conventional kiln and it takes a lot to extract down to low moisture contents, the law of diminishing returns seeming to apply when you get below 20%. So how do you go about building a kiln? The first decision is the size of the unit. There's a temptation to build one too big for your needs. You tend to look at the massive pile of timber you have already accumulated (Photo 1), and design one to suit this sort of volume, which is not realistic. It's better to calculate how much timber you actually use in, say, two months and make your kiln this size. They work better when completely full, and although you might have a backlog at this stage, once you get into the drying cycle it may take some filling. This is perhaps one situation where it's better to think small rather than big, and if you do outgrow the capacity it is more flexible anyway to have two small kilns than one large one. We've already seen that the drying chamber must be rigid, airtight, insulated and capable of opening for easy loading and unloading. Over the years I have built five different kilns and have tried all the options. The problem with most home-built kilns is not so much insulation, which is easy with sheets of thick polystyrene, as in getting them airtight, yet openable. A large insulated box is the answer, but if you have built it from timber with layers of insulation, each side is heavy and awkward to move when you come to load it. Also getting the doors to seal perfectly can be difficult. The advantage of building your own is that you can make it the size you want, perhaps to fit the end of the garage or the bottom of the garden. The easiest option is to buy a suitable chamber of some sort. 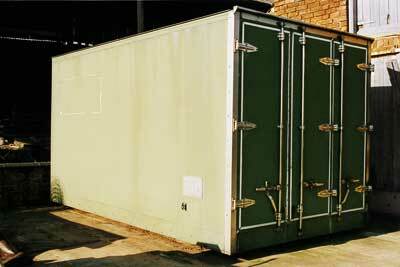 Redundant shipping containers are one possibility, but although you can get them ready insulated, they tend to be big and bulky, and not especially cheap. Visiting a commercial-vehicle scrap yard usually provides something usable. 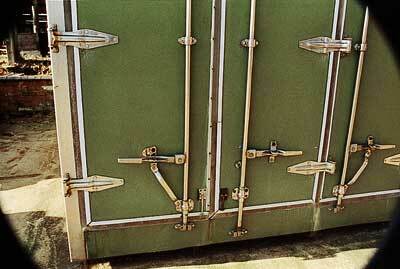 My own kiln is made from a fridge body I found on the back of a written-off vehicle in a local yard (photo 2). The body was intact and had been used for delivering frozen foods. So the insulation was superb, the inside lined out beautifully smooth, and the three doors at the back could either be opened individually or as a whole for loading or unloading (photo 3). There were even lights inside and the thing was totally waterproof! After a bit of negotiation I bought this for ï¿½500 and had it delivered to my workshop. This, I think, compares very favourably with building your own. The necessary sheets of marine ply and all the insulation would almost cost this, and there is no way I could construct anything as strong, with doors which shut and seal as effectively, all hinges and catches being heavy duty stainless steel (photo 4). The downside was that I had to do a fair bit of work cutting it off the lorry chassis and modifying the back end, which originally had walk-in access steps. I also had to remove the original fridge unit, which was mounted at the front of the box, but this provided an ideal location for the control panel (photo 5); there was even a built-in thermometer, which I could leave in place (photo 6). The box measures 7 x 6 x 13ft, almost too big for my current needs, but I felt that it was such a good buy that I could work with it. Several dehumidifiers are available to fit these small kilns, varying from quite tiny to commercially large. They consist of the main unit, which is mounted inside the drying chamber, and a separate control box mounted outside (photo 7). 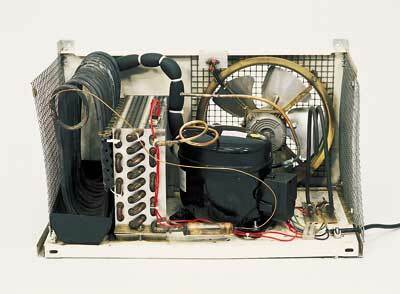 If you look at the actual drying unit, it consists of a compressor unit, refrigerated coils, heat exchanger and a heating coil, with a fan to draw the air over the chilled coils (photo 8). Water which condenses on these coils drips into the tray below and runs away through a drain hole. I chose a mid-range model, capable of dealing with a load size such as this. But because I wanted to mount the unit at the end of the box, I was concerned that the airflow from the dehumidifier alone would not be sufficient, so at first installed an extra fan. In practice this proved inadequate, so I eventually added two more (photo 9), all of which can be switched independently to get the airflow I need. The art is to get the air circulating evenly throughout the timber stack, an almost impossible task, but the more forced draught you have the better. My unit was installed behind a false front at the back of the box. This allows air to be drawn in fairly low down, this then passes through the dehumidifier and is then blown out on top of the stack. A plastic sheet over the top prevents the air short-circuiting; the extra fans blow it down to the other end of the box ready to be drawn back through the stack. Photo 10 shows the kiln in the early stages of filling with the sheet rolled up out of the way. I have found this works really well, with very little variation of moisture content through the stack. Your drying unit will be provided with charts giving guidance for load sizes, operating temperatures and times for drying, but I've found it to be very much a matter of experience. It will take you several loads before you feel confident about what you are doing. 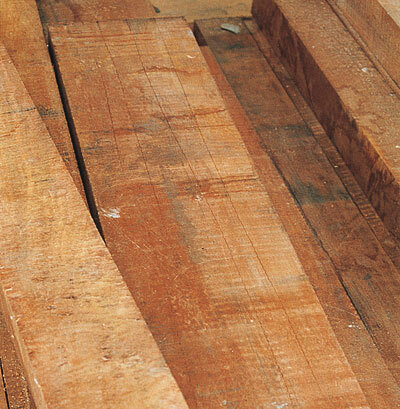 As a full load of timber represents quite a big investment, it's worth starting with everything well turned down to prevent any serious drying damage. All you are going to do in this case is take longer than necessary, but at least you will have got a feel for how it all works. If you are mixing sizes always work to the biggest one or you will establish moisture gradients too steep, and cracks will soon develop (photo 11). This was the result of basing my calculations on the smaller section material; all the large ones then cracked badly. I have found that a full load of about 300 cu ft of hardwood with an initial moisture content of 35%, will dry to 10% in about two months on a fairly gentle cycle. 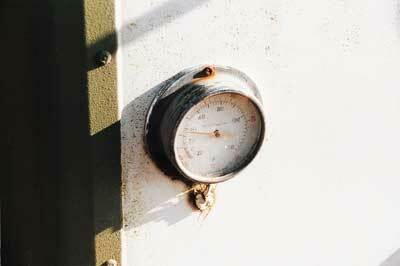 Operating temperature seems to stabilise at around 35%, mainly generated from the drying process rather than using the heaters. 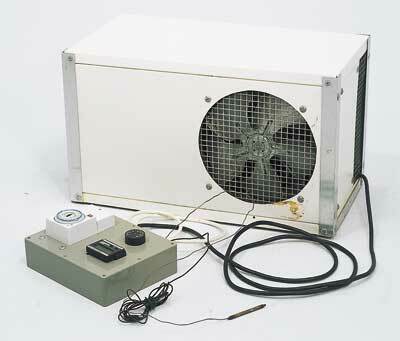 In fact the smaller units do not have additional heaters, relying purely on self-generated heat. Drying times will vary enormously, depending on the thickness of the material, the initial moisture content, the species and the load size, but at full speed I would expect to fill a 25-litre drum with water every 24 hours. It's staggering where all the water comes from! The main control you have over the unit is how long it is on for. The timer on the control box switches the unit on or off in quarter-hour hour steps; you simply select how many of these you need at a time. Initial start up has to be fairly slow, or the water will freeze on the cooling coils. But as the chamber temperature gradually increases you can leave the dryer on for longer periods. The temperature sensor will switch the heaters on if the unit is not generating enough heat on its own, but again it's better to start with the settings low and let everything build up slowly. Loading the kiln is quite important too. You must ensure that the airflow is not restricted, so stickers should be parallel to the air movement, not across it. A small kiln can be loaded in situ, but this becomes awkward with a bigger one. As the stack builds you have to lift boards to the back with restricted headroom. Consequently you may need to rig up some sort of rail system, loading the stacks in the doorway and then pushing them into the kiln when they are complete. 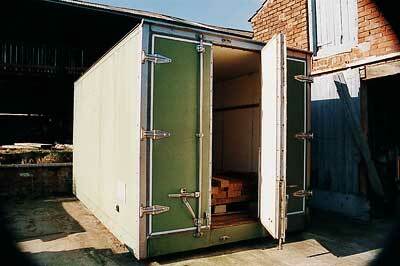 I build mine on large pallets and lift them in with a fork-lift truck. When the kiln is full and started up, avoid the temptation to keep opening it to see what is happening. 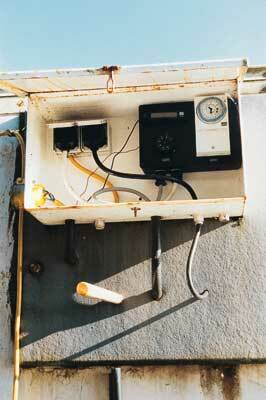 This is why good temperature monitoring is important. But the best indication of how things are going is to check the amount of water running out. This will progressively increase, then stabilise for a while before quickly tailing off. There is a danger here of 'overcooking' the load, so be vigilant when things start to slow down. Open it occasionally to check the final moisture content of a few sample boards. Once you get to the level you want, switch off the dryer but leave the fans running for a couple of days. This allows it all to cool and the moisture gradients to even out. Bringing hot wood into a cold atmosphere can cause it to crack. These small kilns really do work well, even if they are inexact, and you need to build experience before you are fully confident. The main advantage is that you can tailor one to your exact needs, and it's quite difficult to make a mess of the wood, provided you take it very gently. "My own kiln is made from a fridge body I found on the back of a written-off vehicle"